Job 2: 11-13 When Job’s three friends, Eliphaz the Temanite, Bildad the Shuhite and Zophar the Naamathite, heard about all the troubles that had come upon him, they set out from their homes and met together by agreement to go and sympathize with him and comfort him. When they saw him from a distance, they could hardly recognize him; they began to weep aloud, and they tore their robes and sprinkled dust on their heads. Then they sat on the ground with him for seven days and seven nights. No one said a word to him, because they saw how great his suffering was. While in graduate school I took a class on grief. 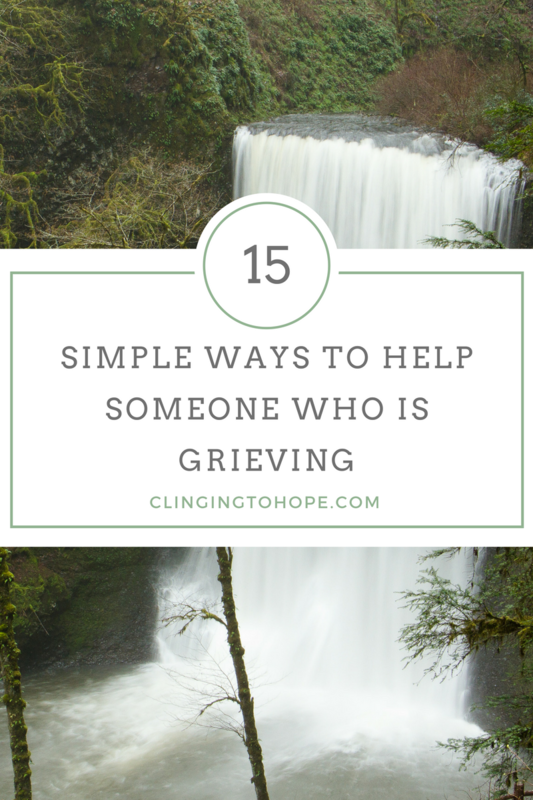 Not because I didn’t understand grief, but because I wanted to understand how to help others who are stuck in grief or avoiding grief. For a part of the class, the professor had us look at this passage from the Bible and talk about the things Job’s friends did to help him in his grief. We talked about how they wept for and with him. We talked about how they traveled a long way to be with him and how they didn’t recognize Job because he was so changed by his grief. We talked about how they sat with Job and didn’t say a word for 7 days. Then my professor said something I’ll never forget. He said “Job’s friends did everything right . . . and then they opened their mouths”. In our society, we want to fill someone’s pain with words. 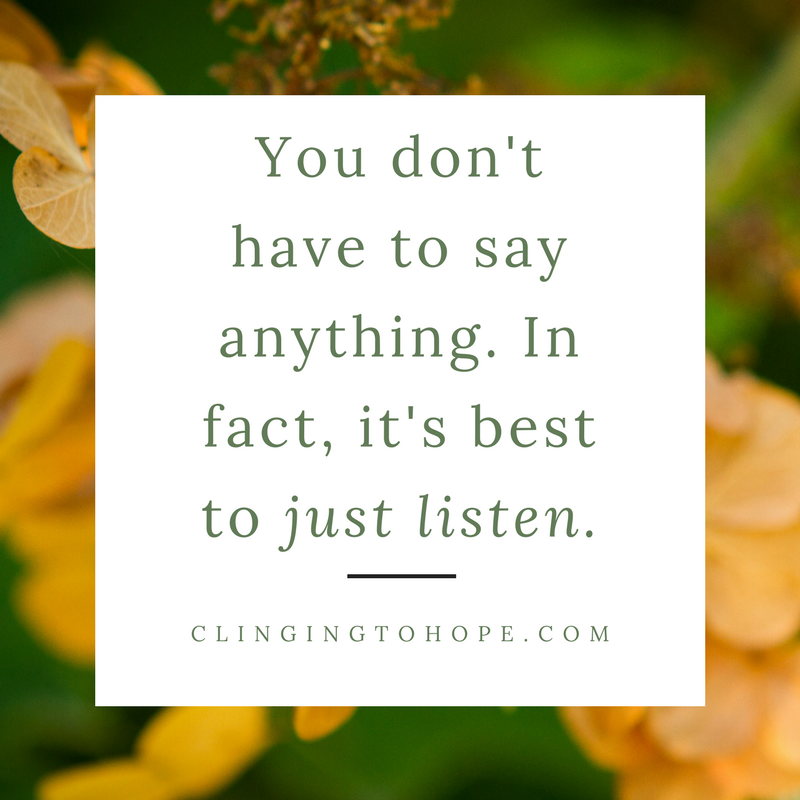 But you don’t have to say anything to help someone who is grieving. In fact, often it is best to just be there and listen. Remember they are hurting; there is nothing you can say or do to make the hurt go away. Please don’t try. They need to feel the hurt; it is the only way through this. If you are a practical kind of person, then help with the practical things of life. Do their dishes, clean their house, do the laundry. They probably can’t handle the simple tasks of daily life. Everyone is different; if they see this kind of help as an intrusion, then don’t force it. When the drama of the loss dies down and you return to your life, don’t forget their pain is really just starting. When you think of them let them know. It’s easy to feel forgotten when the world returns to normal. This is when the majority of the support disappears and letting them know you remember them is a gift. Don’t be afraid to mention the person who died. Especially to a grieving parent. It may make them cry, but I promise you it is music to their ears. Share your memories. When someone dies, no new memories can be made with them. You might have a memory they have never heard or didn’t know about their loved one. When new memories cannot be made learning something new about a loved one is a wonderful gift. As I was preparing this blog post, I got a text message from the mom of a young man my son was in school with. They were talking about gym class and he shared a memory of Dawson with her, she turned around and shared it with me. Apparently, her son liked to dive to the ground when they were playing ball in gym class. Dawson didn’t like it and would shout “stoooooooopppp” in an exasperated voice. In that moment I heard a new memory about my son, and for just a split second, it was like he was here with me again.